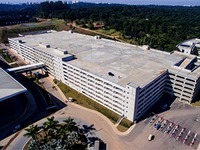 Equipotel is the event synonymous with hospitality in Brazil and Latin America. An environment conducive to hotel owners, motels, inns, restors, campings and other establishments, who seek solutions for the first time in the ability to manage their business and welcome their customers. With a broad sectorial exposure, a wide range of experiences and extensive content programming, Equipotel is consolidated as the right destination for those who offer products and services related to the art of receiving well.